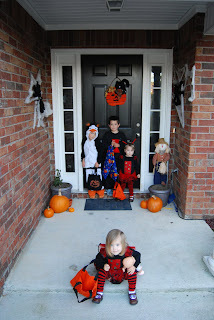 And what could be a sweeter treat than this little group of trick-or-treaters? L is always the stubborn child, refusing to stand with her siblings for a picture. But when she finally gives in, her smile makes me forget about how difficult she can be! This year we had a couple of new pumpkins on the porch. And as we loaded up the Choo Choo wagon and got ready to go, I realized why this scene looked familiar. Yes, in case you were wondering, this is the picture from last year. 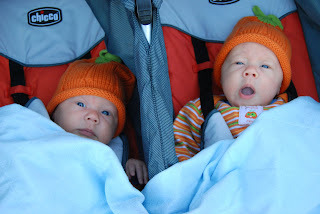 If you're wondering why the kids are wearing the same exact costumes they wore last year then let me explain. 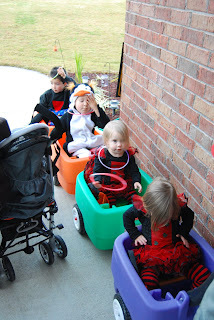 The girls wore their costumes from last year because 1) they fit and 2) I think they are adorable in those tutus! M wanted to dress up as Diego but after wearing the costume to the Halloween party last weekend he wanted a change. His black widow costume that I made last year was still a perfect fit and he begged to wear it again. Soon J was begging to wear the monkey costume I made for him last year. I convinced him to wear the penguin costume because I never buy costumes and since I spent that money at Gymboree I was not going to waste it. Besides, he wore the monkey to the second party last weekend. Did I mention last weekend? It was great! 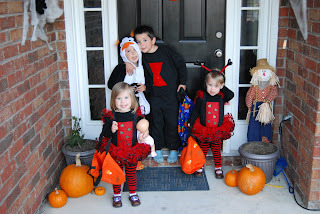 I took the kids to our MOMs Halloween party. By myself. The kids had a blast and I survived. Then I took all 4 of my boys to another party that evening. A good friend of mine is famous around here for her awesome Halloween parties. This year she outdid herself with an underwater theme. She's so creative and her parties just rock. There are lots of kids and plenty of adult conversation. She even hands out a "Golden Gourd" award to the person with the best costume. I finally uploaded the pictures of M's birthday. We didn't have anyone over this year so it was just the 8 of us. 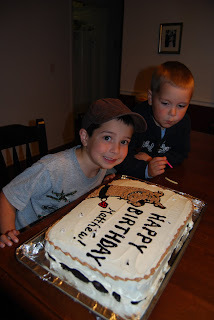 M wanted a Scooby Doo cake and I attempted to throw one together at the last minute while holding a fussy baby. He said he loved it so I guess it turned out ok! 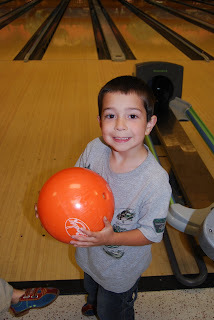 We did go bowling and M had a great time. His high score was an 80! He hardly even used the lane bumpers. After the rough time we've been having with breastfeeding lately, it's so sweet to see these little babies' personalities starting to emerge. They all love J and always smile at him. 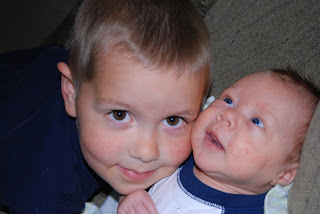 L and J are the most interested in the babies although M tells me every single day that he loves his baby brothers. Of course that's usually followed by "and not Josh or the girls." My spirited child, right? I'm feeling much better today as I'm recovering from a bout with mastitis. It came on suddenly yesterday and early this morning my fever broke. I'm guessing that this is related to the problems the babies have been having. I nursed them all night to try and unplug the affected milk duct. Fortunately it worked! We had our second photo shoot in Atlanta on Thursday. I should have our first family photo ready to share soon. The photographer actually took a picture of all 8 of us together! The other pictures were tandem nursing shots for EMAB and an adorable pose of the babies in a bird's nest wearing the angel wings. I should get to see the photos from our original shoot soon and I'll share them if I can. For now, here's a shot of Sarah in her wings. I'm working on my first Q & A post, so if you have any questions you'd like me to answer, just leave a comment. I really do read each and every comment even if I can't find the time to personally respond. By the way, if anyone can recommend a good blog design company, let me know. I'd like to see about getting my blog revamped as my birthday gift to myself this year.